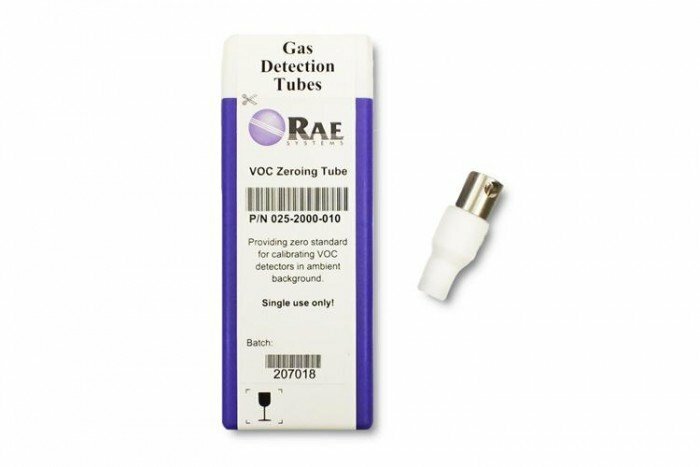 This VOC Zeroing tube from RAE Systems is ideal for calibrating VOC detectors in an ambient background. One pack contains 10 tubes (7 mm O.D). It purifies ambient air to forma zero standard for the calibration process. It’s important to carry out calibration at the same temperature, humidity and flow as the measurement is. These tubes have a shelf life of three years and can be used in a temperature range of between -10 to +50°C. The VOC zeroing tubes are for single-use and feature a high quality media which removes the VOC contamination. The biggest advantage of using these tubes with PID instruments is it provides as accurate as fresh air zero as possible. Any instruments using the zeroing tube must be equipped with a Flex-I-Probe inlet. Suitable instruments may include the RAE Systems MiniRAE 2000 and the ppbRAE 3000. View more information on the ppbRAE by clicking here.